The Collyweston Slater is a traditional coaching inn dating from the 17th century. 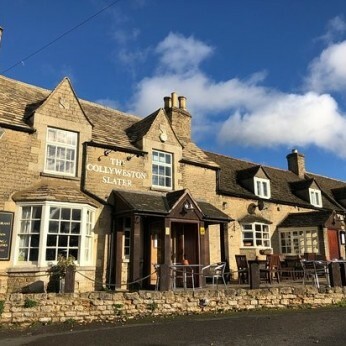 Situated in the heart of the picturesque village of Collyweston, we are 5 miles from Rutland Water and only 3 miles from the historic market town of Stamford. An open fire greets you as you enter the flag-stoned floored building. Cosy and warm, you will find real ales (and free Wi-Fi), great hospitality, fine wine and locally sourced food on the extensive menu. There are three comfortable, en suite bedrooms where you can put your feet up after a day’s walking around the shores of Rutland Water or after a spot of fishing, sailing, cycling or horse riding. The Collyweston Slater is also a convenient stopover for business clientele as we’re only a few minutes’ drive from the A1 at Stamford, the A47 and close by to Peterborough, Leicester and Corby. This is a traditional English inn where great pub food, family hospitality and customer service is the focus.